No, it's a hangar with a house inside. Well, it's all of the above for 62-year-old Daniel Shaw, a plumbing contractor at Geneva, Fla. Who has given new meaning to the term "hangar home." The structure is 50' wide x 60' deep x 30' tall, all metal/ However, a 45' x 15' Schweiss hydraulic door sporting a wrap-around porch with decorator railing, table and chairs, a "walk through" door with stylish window, and veranda "roof" gets your attention. Even more so when this big door opens and entire patio deck lifts with the hangar door. "It started with the idea that I wanted a hangar home that didn't look like a hangar," said Shaw as he reflected on his one of a kind structure. "Hangars are basically ugly. "We wanted to jazz ours up just a bit," he said. "When you drive up to it and push the remote button people are absolutely amazed!" And with good reason. The interior represents a quaint European street scene complete with hotel entrance and 2nd floor walk-out balcony. To the left, there's a working tavern with bar stools and a false-front ice cream store. To the right, a laundry room, office and fake "yarn barn." Upstairs hosts a master suite with bedroom, closet and bathroom. The black-painted interior ceiling features both star lights and mood lighting, excellent for movie viewing when the big hydraulic hangar door is shut. Ironically, Shaw doesn't even live in the lavish hangar; it's his "guest house." Shaw said when he told the Schweiss door people that he wanted a four foot metal truss across the front of the door, they were skeptical. Traditionally Schweiss designs an 18-inch reinforcing truss for their hydraulic doors. 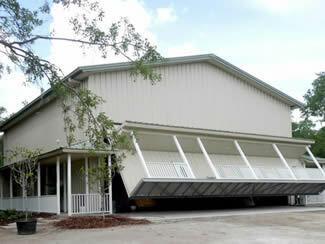 The Schweiss team wasn't initially aware of Shaw's full-width veranda porch being built into his hangar door. But they got excited about the unique challenge. "If you think it, we can build it," has become the working mantra of the Minnesota based firm which thrives on the business theme that the customer drives the deal. "We wanted to make certain that our door helped bring Dan Shaw's dream alive," said Mike Schweiss, CEO of Schweiss Doors. So they juggled computer-driven templates and welding dynamics (including a larger hydraulic system for the heavier door) to better facilitate the unique ideas incorporated into his remarkable hangar home. To put it mildly, the place glitters with his decorating schemes. "I call it Danville," chuckled Shaw, "And I'm the Mayor." Danville sports its own community bar with fashion-smart bar stools. A working Lp gas fireplace adds comfort to the tavern. Plus there's a 14' x 15' downstairs library/guest bedroom. His huge livingroom with 30' ceiling even includes a 26' tall palm tree; also an oak wood stairway to the second level master suite area (an elevator also provides lift service to the upper floor) which has a 15' x 21' master bedroom; 8' x 10' closet and a sizeable 10' x 15' bathroom. His 'finish and trim' carpenter was a young man who coincidentally was in his son's Cub Scout troop 17 years go. This master wood finisher did the classic crown moldings and other special trim features that give Danville a very detailed look. Even the California style master closet upstairs has built in shelves and dresser. 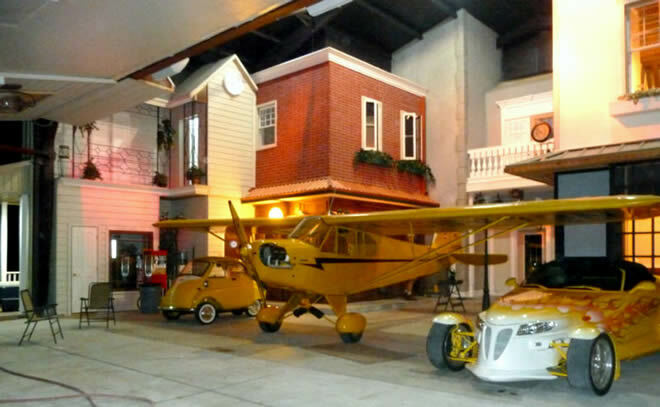 And perhaps because Shaw is a plumbing contractor, his hangar home has three bathrooms. He flies his 1946 Piper J3 - upgraded last year with and 85 hp engine - or his 1980 Cessna 172 with 180 hp engine and STOL wing. Danville hosted its first neighborhood party the weekend of May 9-10 to celebrate the annual association picnic of this 45-acre airstrip located "almost next door" to the Kennedy Space Center and which includes eight building lots on Lake Harney (St. John's River basin) near Orlando. Both to provide comfort from summer heat and the cooler winter season, the outer building was insulated with a vinyl/fiberglass insulation typically used on metal buildings. However his wood frame "inside house" also has six inches of insulation. Engineering specs called for a 120 mpg wind endurance criteria. 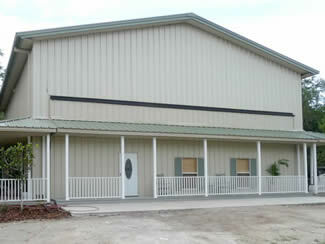 Conventional property insurance worked for this facility. Shaw estimated Danville cost him $225,000 "...but that was because my neighbor Joe Pires, who also built a hangar home, worked closely with me on the design and actual construction," he said. "To keep the cost of Danville low, I didn't enter the concept with a fixed material list," Shaw continued. "You have to build with the flow of what you can find." And I must admit, I'm pretty good at scrounging, plus Joe searched Craig's list for some super buys." Pires, a financial planner who also flies gyrocopters, bought one of the lots from Shaw but didn't have any construction background. People buying lots on this private airstrip are required to build a house before they can build a hangar. "But if you build a hangar house prior to building your home, you have housing for your airplane plus a place to live while building the house," Shaw said. "And when it's all done you have a very unique guest house."